Civil War Battles research papers overview some of the major military conflicts during the civil war. 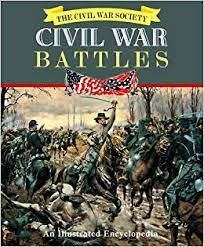 This is a topic suggestion on Civil War Battles from Paper Masters. Use this topic or order a custom research paper, written exactly how you need it to be. By March 1861 South Carolina, Mississippi, Florida, Alabama, Georgia, Louisiana, and Texas had seceded from the Union. Even before Lincoln’s inauguration in March of 1861, Jefferson Davis had been elected and inaugurated as President of the Confederate States of America. At this time war did not seem entirely inevitable – Arkansas and Virginia both rejected secession in late March/early April – but it did seem increasingly likely. In one sense, the first shots of the Civil War were fired even before this time. In January 1861, a Union steamship – The Star of the West – was making its way to supply Fort Sumter, in South Carolina. It was attacked by Confederate gunfire and was driven out of the Charleston port. But it was on April 12, 1861 that the first true act of Civil War occurred. The issue again was Fort Sumter, a Union garrison in the first state to secede from the Union, South Carolina. The Confederates attempted to negotiate a Union withdrawal from the fort, and when this failed Jefferson Davis ordered the fort to be taken by force. Confederate guns fired on the fort for nearly twelve hours and on the afternoon of April 13th the Union commander surrendered the fort to the Confederate forces. Despite the fact that there were no casualties as a result of the bombardment, the taking of Fort Sumter marked the beginning of the Civil War. Events now moved rapidly. Reversing earlier votes, Virginia and Arkansas seceded, followed quickly by Tennessee and North Carolina. This all occurred in May 1861. During this month several riots broke out, largely in Border States. Several of these involved army or militia troops, but were more preludes to war than actual events of the war proper. It was on June 3, 1861 that the Union made its first move of aggression against the Confederacy, although it was a small battle by any measure. A Confederate force was stationed in Philippi, in western Virginia, and Colonel Thomas Morris led Union troops from two directions in order to surround the rebel encampment. The battle lasted less than a day and resulted in some thirty casualties. The Confederate troops had been taken by surprise and were forced to retreat from Philippi. This battle led to the creation of West Virginia. The western counties of Virginia had opposed secession and now formed a new state, which was admitted to the Union in 1863. Other minor engagements followed in early July of 1861. In the third week of July, Union forces made their first serious move into Confederate territory. The aim was the immediate capture of the Confederate capital, Richmond. But on July 21, Union troops first attempted to secure the railroad junction at Manassas and this battle – The First Battle of Bull Run – was the first major engagement of the Civil War. Battle of Olustee - Battle of Olustee Research Papers discuss one of the battles of the Civil War that was fought in Florida. Order a research paper on the battle of Olustee from Paper Masters. Why the North Won the Civil War - Why the North Won the Civil War research papers look at reasons for the victory of the Union over the Confederate Army in Civil War Battles. Pickett's Charge - Pickett's Charge research papers discuss the last day of the Battle of Gettysburg of the American Civil War. The Battle of Chickamauga - The Battle of Chickamauga Research Paper explores one of the bloodiest battles of the Civil War. Civil War and African Americans - Civil War and African Americans research papers examine the role of the black soldier and African Americans at the time of the Civil War. Black Soldiers and the Civil War - Black Soldiers and the Civil War research papers report that African American men were often compelled to join the military during the Civil War. African American Soldiers and the Civil War - African American Soldiers and the Civil War research papers look at the entry of black soldiers into the Civil War. American's First Battles - American's First Battles Research Papers look at an example of an order placed on American's Battles, and gives requirements for an argumentative essay. Paper Masters writes custom research papers on Civil War Battles and overview some of the major military conflicts during the civil war.